BrowserStack is an online emulation service which allows you to virtually test websites on the most popular devices across iOS, Android and more. Each “device” is set up on BrowserStack’s servers with the same parameters as its real-life counterpart, which means what you see on screen is as close as possible to the real thing. 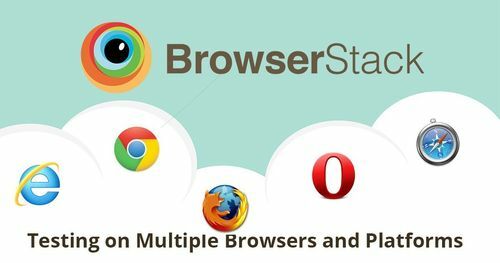 In addition to the wide range of mobile emulators, BrowserStack also gives you access to hundreds of versions of desktop browsers including Firefox, Chrome, Opera, Safari and Internet Explorer across multiple operating systems. This is particularly handy when the need arises to test in older browsers, even IE6 *shudder*. Say goodbye to your lab of devices and virtual machines. One of the main concerns that developpers face, is how their website/app is going to look on different browsers and screens. Now there are various of solutions for this, but one of the most effective tools to use is certainly BrowserStack. BrowserStack offers a live, web-based browser testing with instant access to every desktop and mobile browser (currently more than 300), with the ability to test local and internal servers, providing a secure setup. The cloud-based access means no installation is required, and the pre-installed developer tools (including Firebug Lite, Microsoft Script Debugger and many more) are useful for quick cross-browser testing and debugging. You can also do the same live testing on mobile operating systems such as iOS and Android, which is very useful for anyone who is planning to launch a mobile version of his website.